Alsace is a historic and cultural region in eastern France (on border with Germany and Switzerland). It lies on the west bank of River Rhine and the Vosges mountains. The region is famous for the villages along the wine route as these villages and towns offer colorful half-timbered houses. The region is also very famous for its cuisine. It is a city of art with a very nice historic center. The old town is very charming with a lot of prestigious monuments. Of course, the architecture of the houses tops everything. 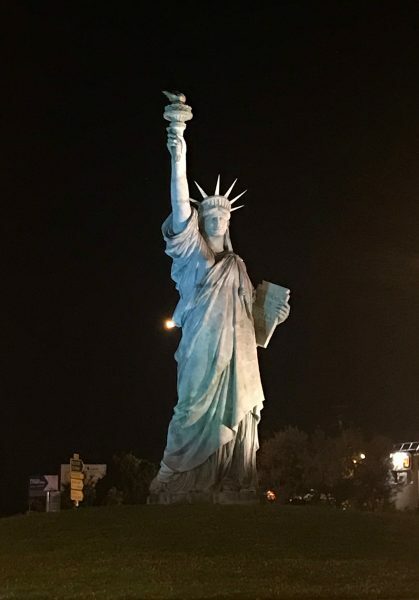 Fun Fact: Did you know that the sculptor who designed the Statue of Liberty (name: Bartholdi) was from Colmar and the replica of the statue in Colmar was dedicated to commemorating 100th anniversary of his death on July 04, 2004. The replica stands on the roundabout close to Colmar airport (north entrance of the city from the highway). 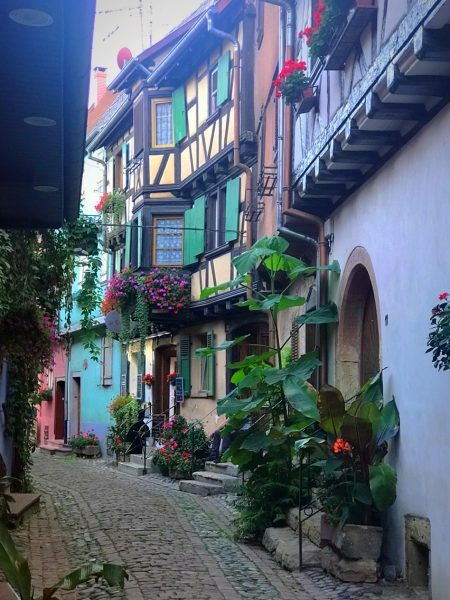 Straßbourg is 73km north of Colmar and is one of the most famous cities in the region. It is a big city that offers a lot to see and admire. 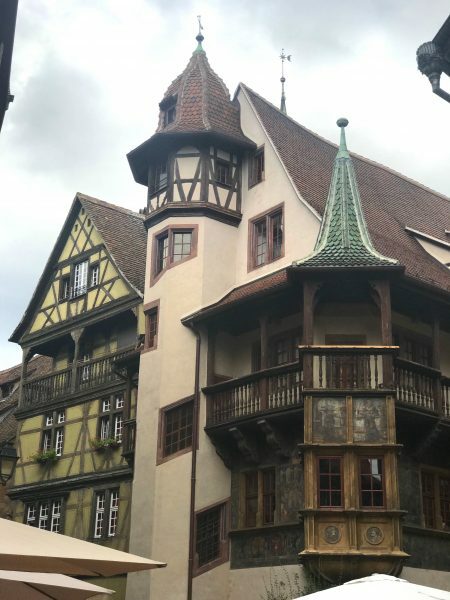 We did not visit Straßbourg during our 4 days trip as we stayed around Colmar and explored that side of Alsace. Though, I have been to Straßbourg before and would totally recommend to make a stopover for few hours if you are passing by. 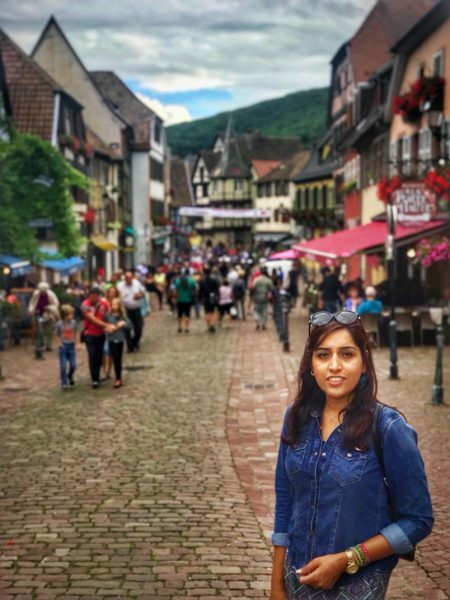 Colmar is a must visit, but apart from that, there are so many beautiful villages only 30 to 40 minutes distance from Colmar, that you can choose as many as you like based on your time and interest. 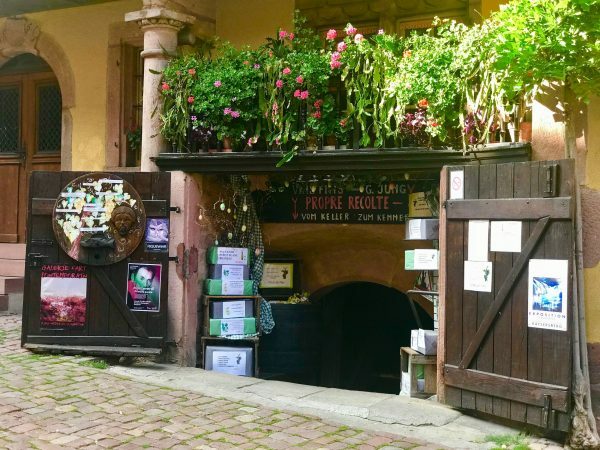 You can pretty much choose any small village in Alsace and you won’t be disappointed. There are some very famous ones close to Straßbourg as well, but to visit it all, you need about 10 days at least. But our stay was enough to get the flavour. 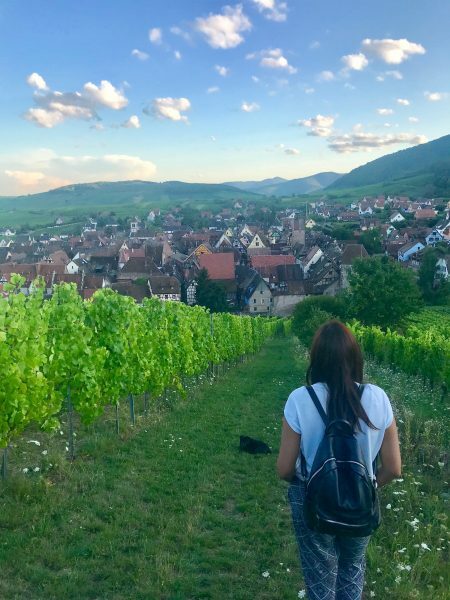 Alsace has a lot to offer and you can easily spend two weeks here and still would have something left to do. But, depending on time and your interest, you can make priorities. Apart from the villages above, you have some other interesting activities as well. This medieval castle mountain with the medieval fortress of the Haut-Koenigsbourg is the most famous castle in the area. But, to go there, either go really early when it opens or before the closing timing. Otherwise, you will have to wait in the long queue of the cars trying to get to the castle. There were so many cars on the street going up the hill that we simply returned without visiting. Volerie des Aigles: This is an Eagle Park in the ruins of the medieval castle of Kintzheim. Montagne des singes: Walking the 24ha forest among the Barbary Macaques. Now this one is for the car lovers. It is said to be the largest car museum in the world, showcasing 400 classic, prestige and racing cars which trace the history of automobile. It is an outdoor museum depicting the old life that used to be in these Alsatian villages. There is a fee for the visit. 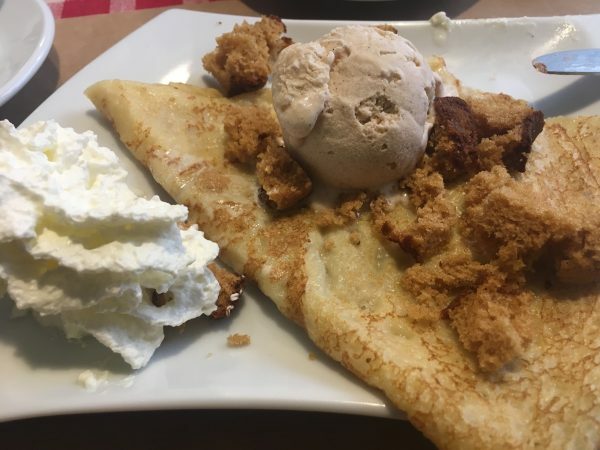 Tip: Flammkuchen and pancakes (crepes) are good almost everywhere in Alsace. 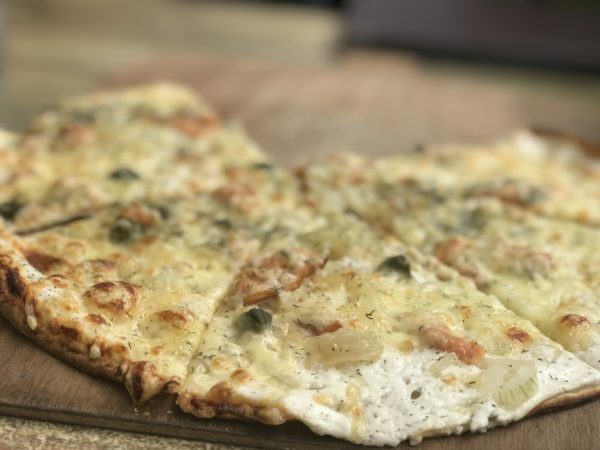 This is the region where Flammkuchen originates from. 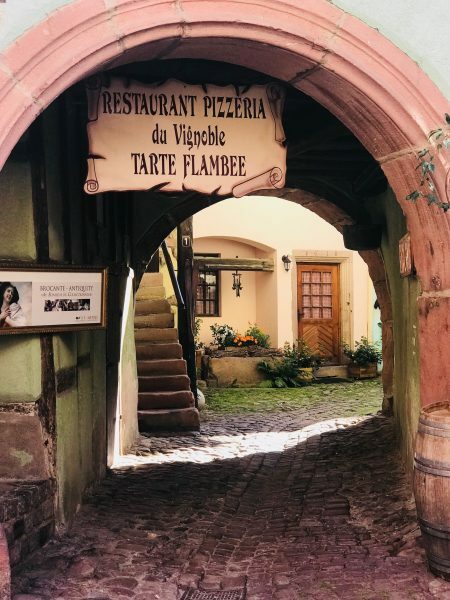 When in Colmar, try the flammkuchen place in the Little Venice area, exactly where the boat tours start. 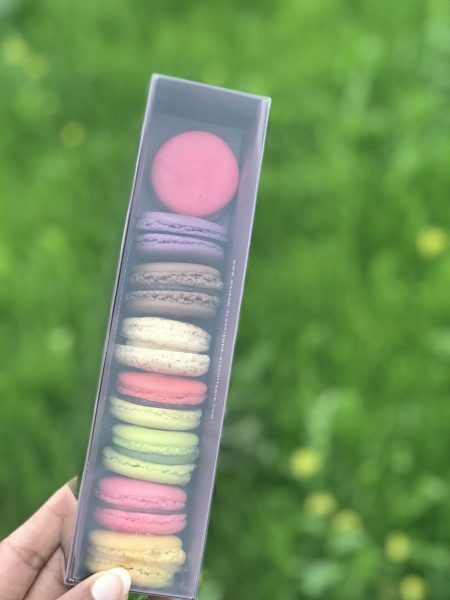 Also, do not miss macrons from Macarons de Riquewihr (They have a bakery both in Colmar and Riquewihr). 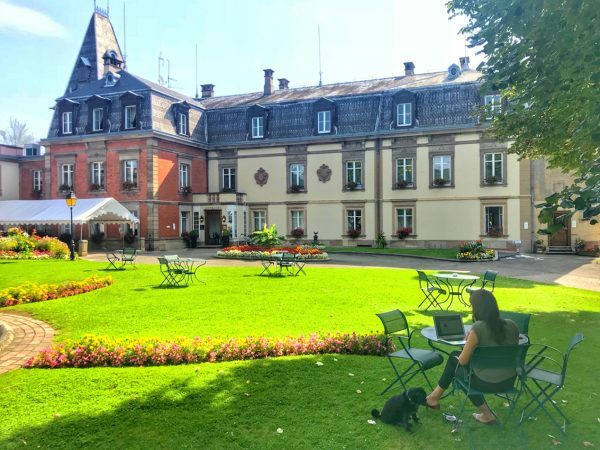 If you are by car, you can stay almost anywhere in Alsace and can make day trips easily to all villages. Otherwise Colmar or Straßbourg is your choice. I personally really liked the village Kaysersberg and found it very nice for staying. Though, it will be very quiet after the day tourists are gone (which is super cool if you like it). There are so many nice bed and breakfasts or boutique hotels, but if you plan to visit between June and Sep, book at least two to three months in advance. I saw some places that I would have loved to stay but could not reserve as they were booked out. We stayed at Chataeu d’Isenbourg and absolutely loved it by all means. It is proper Alsace old castle experience with a French touch. And not just the place is awesome, but the people there are very nice and make your stay even more special. 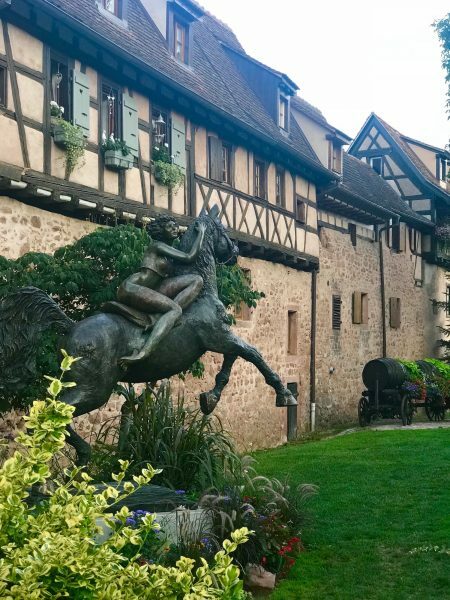 This castle on the famous wine route dates back to 16th and 17th centuries and is perfectly located for enjoying Alsace. It offers gorgeous views over the village of Rouffach, the Vosges foothills and also the Black Forest in the distance. It is a perfect place to pamper yourself and relax. If possible, select a room on the second floor with views over Rouffach. This place was booked out, but I would love to return for this. Alsace gets quite cold in winters, so the best time is of course summer (end of May till Sep). But Jul/Aug can be very crowded because of holidays. Also, it is very popular area for bicycle tours between the villages, and peak summer can be a bit too warm for bicycling. 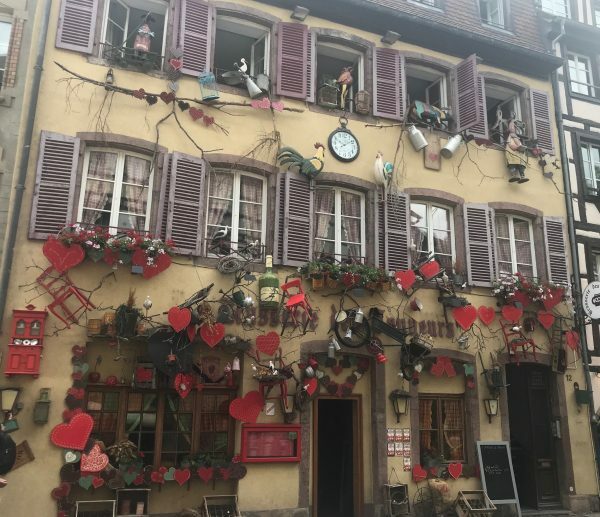 And as I said above, you can easily spend a whole week or two here and still won’t cover it all, but to get the feeling of the area, you can stay for 2 to 3 nights and visit either Colmar or Straßbourg and 2 to 3 nearby small villages. I hope you enjoyed the post and would add this to your travel wish list. 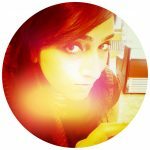 I in addition to my friends appeared to be reading the great tips and hints from your web site while at once developed an awful feeling I had not expressed respect to the site owner for those tips. Those people became as a consequence glad to see them and have in effect certainly been taking pleasure in these things. Many thanks for indeed being quite considerate as well as for making a decision on certain essential useful guides millions of individuals are really needing to be informed on. My sincere regret for not saying thanks to you earlier. I just told my husband that he HAS to take me here. I love these little fairy tale villages! Beautiful photos! I really, really, really hope to make it Colmar by the end of the year/before I move back to Canada. 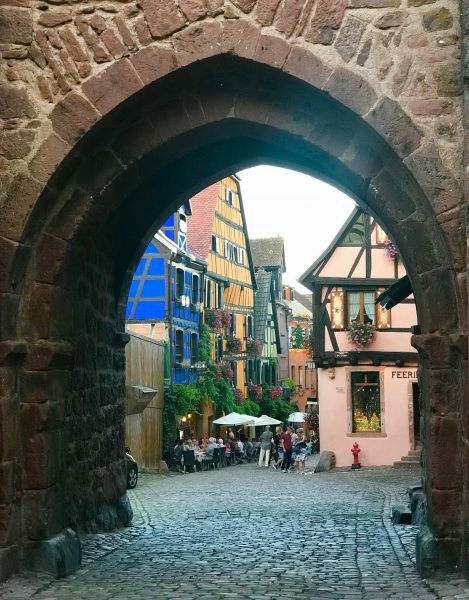 Eguisheim sounds awesome too! Thank you for all of the helpful tips! Oh Gosh Alsace is really fairytale like!! Those beautiful houses, narrow lanes and gorgeous town square. Added to my bucket list on your recommendation. 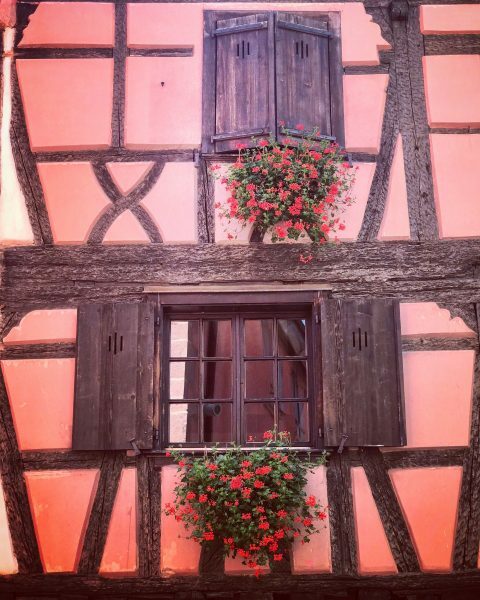 The town of Alsace is so, so picturesque! This is my first time hearing about it, so I’m definitely adding it to my list of European cities to visit. 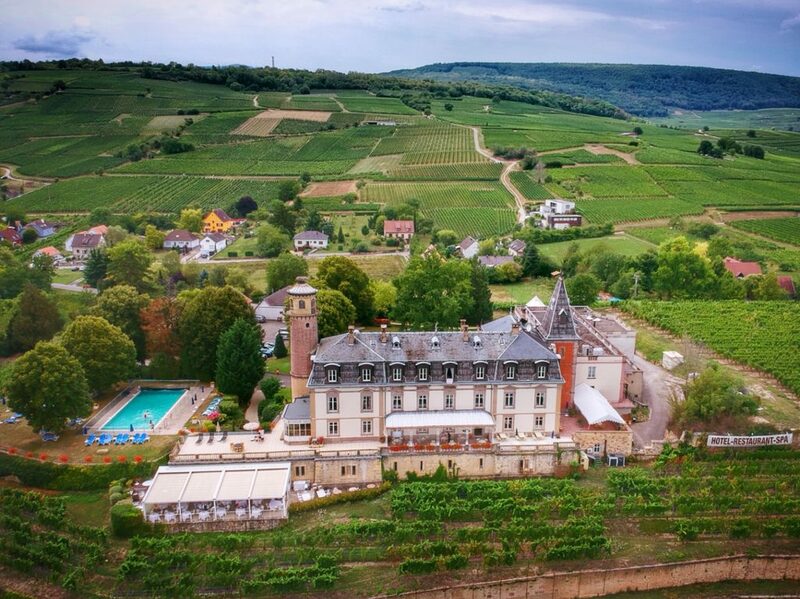 Staying at the Chataeu d’Isenbourg would be an absolute dream, how did you hear about it? Or is it fairly well known? Thanks. I found it through slh website. I’ve been to Colmar and Strassborg during their annual Christmas markets. If you think they’re beautiful now, oh man, visit during the holidays. They turn into festive wonderlands. Thanks for taking me back! Those colorful buildings are so charming. I’m not familiar with this area and definitely adding it to my list. How amazing! I feel like I am in a Disney film reading this. I need to go here. It’s too pretty not to. Thanks for the advise, i’ve added it to my list. 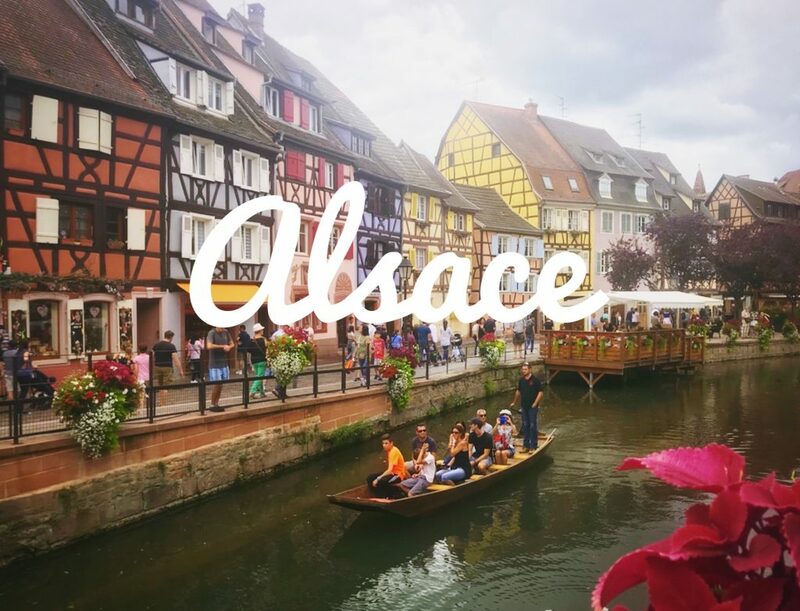 I’ve heard so many great things about Alsace. This is definetly inspiring a visit. 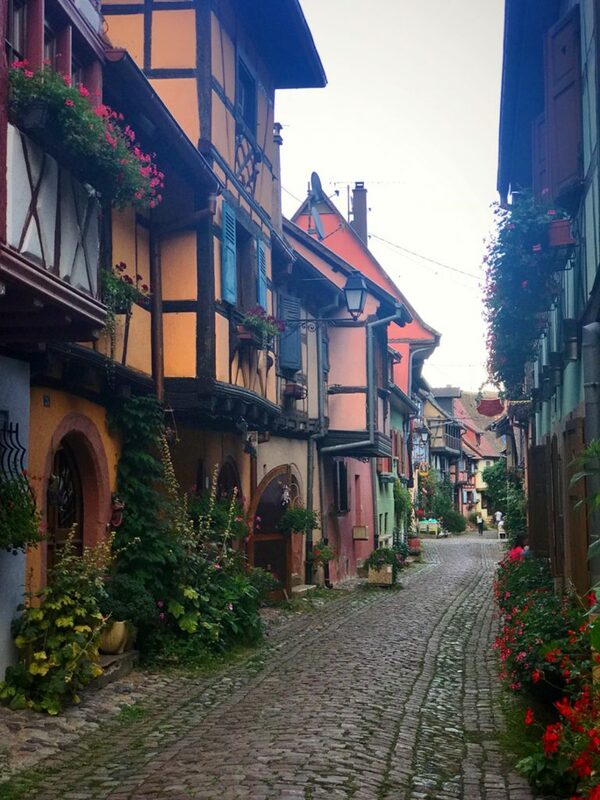 I could look at pictures of Alsace all day. Such a stunning region! It looks like something straight out of Beauty and the Beast (or rather, Beauty and the Beast is straight out of one of these towns). And I can’t believe you stayed in an actual CASTLE – that’s so cool! Was it very expensive? Thanks. If you book well in advance, I think you can find rooms starting 180 Eur a night (without breakfast). This region sounds like a beautiful place to visit! The smaller towns and the food sounds awesome. OMG I AM IN LOVE!!! This city IS a fairytale. That chateau is adorable, I would definitely want to stay there too. Thanks for the tips to visit the castle, we always love visiting castles and I would definitely want to go to the car museum too. Thank you for introducing me to this lovely city!